Roofing chemical is the substance used to improve the performance and life of the roof covering. It makes the roof waterproof and weather resistant which increases the durability of the surface. Generally they reflect sun light and absorbs less amount of heat which helps to control the interior temperature of the building. Roofing chemical helps in reducing electricity bill and emission of greenhouse gases by controlling the inside temperature of the building. Global roofing chemicals market is expected to flourish at a CAGR of 7.8% over the forecast period i.e. 2017-2027. Further, the market of roofing chemicals is expected to reach USD 148 Billion by the end of 2027. Rise in construction project in the world coupled with increasing adoption of advanced and weather resistant coating is widening the demand for roofing chemicals. Moreover, consumer spending on housing product is likely to expand during the forecast period which signals promising growth for chemical roofing market. Further, Europe roofing chemicals market is expected to grow at a substantial rate over the forecast period. Further, government favorable rules and regulation towards the low energy consumption and environment safety is likely to directly impact the demand of the roofing chemicals in the upcoming years. As the worldwide population increases the construction & building projects also increases. Asian countries such as China and India are the population leading countries across the world. Further, roofing chemicals help in reducing the emission of the carbon gases, controlling the inside temperature thus requires less amount of energy for cooling. Moreover to increase the durability of the building is expected to fuel the demand of the roofing chemical market across the globe. Further rising awareness related to the benefits of roofing chemical over the traditional paints is another key factor which impels the growth of the roofing chemical market. Further, government favorable rules and regulation towards the low energy consumption and environment safety is likely to directly impact the demand of the roofing chemicals in the upcoming years. Further, rising construction & housing has driven the growth of coating industries and expected to fuel the growth of the roofing chemicals market globally. 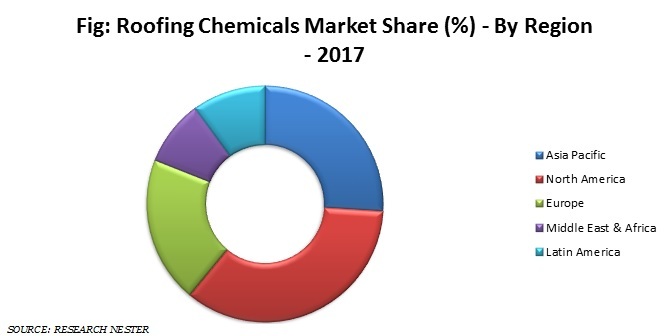 However, high cost associated with the roofing chemicals is expected to dampen the growth of the roofing chemical market over the forecast period.